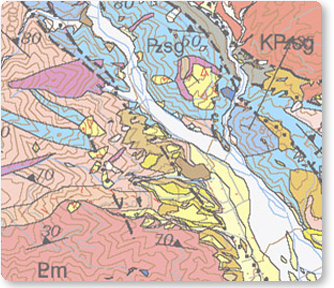 This website is about data models for digital geologic maps and related data sets. Our products and discussion topics range from design philosophy to software implementation. They include: geoscience language; conceptual, logical, and physical models; data exchange; and tool development. We invite you to participate. The site is managed by the North American Geologic Map Data Model (NADM) Steering Committee -- a consortium of American and Canadian geoscientists, database designers, and developers of geologic map information. The NADM Steering Committee sponsors and facilitates cooperative development of digital infrastructure for geologic map databases, and it works on behalf of the sponsoring agencies to develop products and ideas that can be adapted as agency standards for geologic map databases.